Crulius Pontanian is an Imperial enchanter and Acolyte for the Imperial Cult who offers his services and has a variety of magical items and scrolls for sale at Moonmoth Legion Fort. 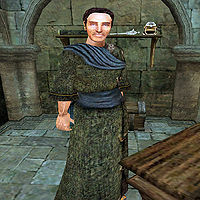 At the beginning of the Meet Sul-Matuul quest, Caius Cosades suggests that you visit him and Somutis Vunnis for some supplies. If you do, he'll give you a selection of scrolls for free, including a scroll of divine intervention, a scroll of the second barrier, a scroll of warrior's blessing and two scrolls of purity of body. This page was last modified on 8 December 2013, at 04:33.